In "The Understudy," now at Lyric Stage Company of Boston, Theresa Rebeck aims a satirical spotlight at the backstage business of theater as a major movie stars clashes with the unknown actor who's been hired to serve as his understudy. We're on Broadway, with a previously undiscovered play by Kafka on the boards. The show is headlined by two major Hollywood stars -- actually one maaaaajor Hollywood movie star along with a second smug star who's made his name in action films. They're sort of the A-List and B-List of movie icons. The producers have cast an understudy for Mr. B-List, who's come to the theater on his day off for a "put-in rehearsal," i.e. a rehearsal specifically to run lines and blocking for the new understudy. In the world of A and B-List actors, the struggling understudy is somewhere around Z-List. And he's told so in no uncertain terms, even though he's devoted to his craft as an actor. Mr. B-List has been in a film that raked in $67 million bucks, so he's providing a pull at the box office. At the same time, the understudy considers the star to be "talent free" and challenges the low quality of his film work, stating that his entire performance in his action blockbuster involved bellowing the line, "Get In The Truck!" So there you have the set-up fraught with friction. Three characters with a variety of conflicts, all trying to work together and get through this one day. Adding to the stress level is the unseen young woman in the control booth who can't seem to control anything, including the lights, the sound cues or the level of her drug use. Rebeck's story is funny enough, but some of the situations and running jokes are repeated to the point where they lose steam. And there are loads of forced entrances and exits to give the individual characters a chance to interact, bristle and unload new information on each other and us. That said, she gives each of her characters a chance to shine and there are enough funny moments to keep things going. She also provides an ending with an unexpected twist. The production is blessed to have as its director the multi-talented Larry Coen, who's also one of Boston's most gifted actors, thereby supplying the entire experience with a first-hand patina of authenticity. Kelby T. Akin is Jake the action hero. Good looking with washboard abs (that he shows off at every opportunity), he's a star. But he fully understands that his co-star in the play (the unseen Bruce) is the real draw for the show. As it turns out, Jake's $2 million price in Hollywood puts him in the low rent district among bigger stars like Bruce who command $20 million just to get out of bed in the morning. Despite his perceived fame and dashing smile, Jake longs to be taken seriously. And while he comes off as a dumb himbo, he knows more than you think he knows, even if he isn't always able to articulate it. Akin nicely reveals the bittersweet frustration of an actor wanting to act, not "star." As Harry the understudy, Christopher James Webb is the legit though obsessive working actor of the group. He's devoted to the project, even though he knows he will probably never get to go on because, as Jake tells him, stars don't get sick. Still, he debates line readings and questions his motivation, approaching the job as though he's set to shine tonight at 8. As sketched by Webb, Harry is as damaged as everybody else, but he's the only one who seems to have a true picture of who he really is. Taking a few well placed shots at stardom and the cutthroat side of both Hollywood and Broadway, "The Understudy" tackles the appalling inverse proportion of dollars coming into the box office vs. the quality of what happens on stage. "Talent" does not necessarily equal "gross." And a celebrity-driven world does not necessarily produce real art -- it just puts butts in the seats. 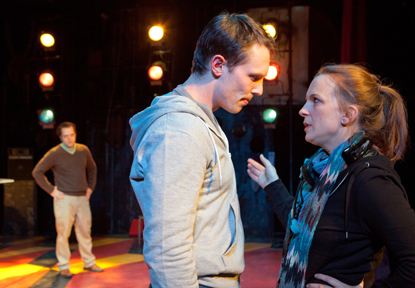 "The Understudy " is at Lyric Stage Company of Boston through January 29. For information, call 617-585-5678.